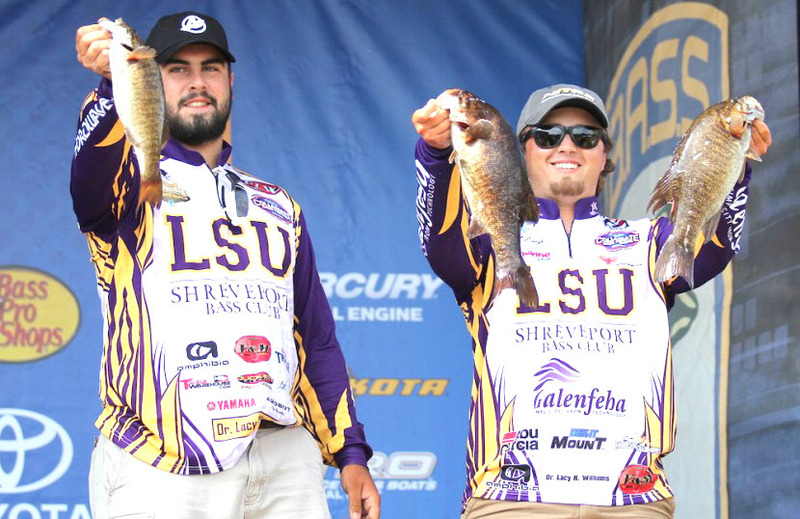 STEVENS POINT, Wis. — The LSU Shreveport team of JP Kimbrough and Jared Rascoe are tied for second after Thursday’s Day 1 of the Carhartt College National Championship bass fishing tournament presented by Bass Pro Shops. Kimbrough, a Benton High grad, and Rascoe, a North DeSoto alum, caught a three-fish limit of smallmouth bass weighing a total of 7 pounds, 15 ounces on Lake DuBay. Josh Bensema and Matthew Mcardle of Texas A&M lead after catching three largemouth bass weighing 8 pounds, 1 ounce. The LSUS team of JP KImbrough and Jared Rascoe are tied for second after Day 1 of the Carhartt College National Championship presented by Bass Pro Shops. Kimbrough and Rascoe started slow Thursday morning but slowly and surely put together their three-fish limit. As soon as they made their move to the new area they boated number two. After grinding it out in that area for three hours they finally boated their third and final keeper with 15 minutes before they had to head back to the launch site. The falling water on Lake DuBay was a popular topic backstage, but LSU Shreveport doesn’t think it will bother their bite much. They do wonder how it could affect the anglers targeting largemouth. The three-fish limit may seem odd to those watching from afar, but the state of Wisconsin allows each competitor to have three fish a piece with the sixth fish being a cull only. There are four anglers fishing the National Championship solo this week so bringing the limit down to three for every team was a must.